Online application forms for both Government & Private ITI admission in Odisha will be available from 10th May 2018 & Students can apply for admission till 6th June 2018, the Department of Higher Education Odisha has notified. Read below details to get more information about Odisha ITI admission 2018-19. Students can apply in their chosen colleges both in online and offline format. To apply online they need to log on to www.dheodisha.gov.in , www.dtetorissa.gov.in , www.skillodisha.gov.in , www.sctevtodisha.nic.in . 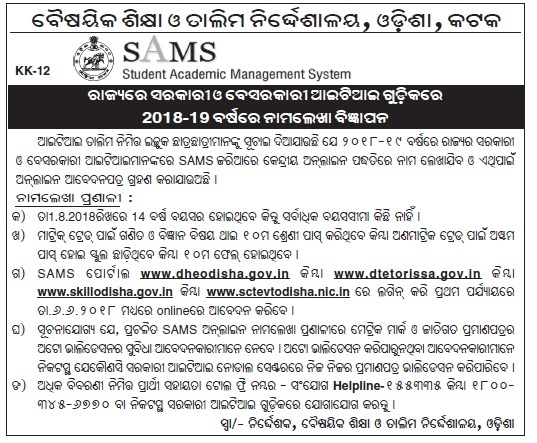 Those who are interested applying offline, they can fill up the format at their nearest Student Academic Management System (SAMS) Resource Centers (List available at www.dheodisha.gov.in). According to the notification released by the department, the first cut-off mark list would be announced on 22nd June 2018 and the first phase admission would be conducted on 27th June 2018. The second merit list will be declared on 30th June 2018 and the admission would be held on 3rd July 2018. The entire admission process will complete by 7th August 2018. Availability of online Common Application Form (CAF) in the website www.dheodisha.gov.in : 10th May 2018 at 12:00 A.M.
Last date for online registration / application: 20th June 2018 at 12:00 A.M.
Last date of submission of print copy of the online applied CAF (in case Not verified online) at any Nodal Center: 25th June-2018 at 5.00 P.M. Merit list Publication Opening of Choice Filling eligible candidates: 28th June 2018 at 11:00 A.M.
Submission Validation of online applied CAF (in case Not verified online) at any Nodal Center. PHASE – II : 25th July 2018 to 07th Aug 2018. Interested candidates may apply online admission through the official website of SAMS http://dheodisha.gov.in/SAMS/index.aspx between 10th May 2018 to 6th June 2018 for taking admission to ITI courses. After apply online application, the candidates will have to take a print out and submit it along with educational qualification, cast certificates etc(which filled in online) self attested copies of relevant documents and submit near govt. ITI before 8th June 2018. Application Fee: 10 Rupees per selected ITI. Click Here for Download Official Notification.